Broadband Demand: Definitions | Strategic Networks Group, Inc.
Demand for high-speed internet (i.e. broadband demand) can be better understood when defined in terms of current, latent, and potential demand. These market demand segments are explained below and they are important because each market segment has unique needs, barriers, and drivers. Understanding them and how they can be influenced is foundational to building an economic case for investing in broadband and digital infrastructure. 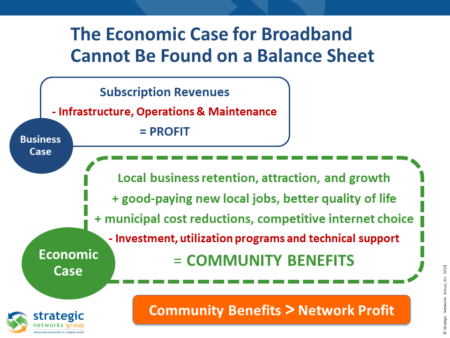 The economic case for investing in broadband includes community and regional benefits (new jobs, local business growth, improved quality of life, etc.) that are off-balance sheet to a private sector business case. Combining the business case and economic case for broadband is what we at SNG we call market potential. SNG’s research shows that demand for broadband and who is willing to pay for higher value services is a product of a person’s awareness and experience in using the internet and online applications. The challenge for internet service providers, economic development agencies, and for governments at all levels, is transforming potential demand and latent demand into current demand. Broadband is an always-on, high-speed connection to the internet where the user does not experience issues with quality of service such as slow or unreliable internet. Although there are definitions for broadband, such as the FCC’s 25 Mbps download and 3 Mbps upload, these are minimum standards – which are neither aspirational, nor designed for the future. Broadband should be approached like electricity or water – how much you need depends on what you are doing with it. A manufacturer will have different needs from a small retail store, or a household. A dynamic and sustainable community will need to ensure that the individual service needs (electricity, water, and broadband) of local businesses and residents can be addressed now and in the future, otherwise the community’s vitality is at risk. Current demand is the current subscriptions to broadband services, also known as take rates or adoption rates. This is an indicator for the level at which broadband is currently being used. Please note that even if an end user has a subscription, it does not mean they are using their broadband connection to its full potential – at SNG we measure this broadband utilization with our Digital Economy index (DEi). Latent demand is the new subscriptions that would be fulfilled if better broadband were available. These end-users, or potential subscribers, already know they want better broadband. This market segment is identified through demand aggregation campaigns, signing people up to ‘fiberhoods’, service zones, etc. Potential demand is the demand that is nurtured and grown when the value of broadband and online services are understood by to end users and personalized to their needs. Potential demand becomes current demand by raising awareness with citizens and businesses about what they could and should be doing online – this is digital transformation. Digital transformation is critical to driving demand and realizing a market’s potential. Raising awareness, providing training and technical support drive higher levels of utilization by households, businesses, and organizations – which in turn drive demand for higher value network and online services. Nurturing demand includes showing ‘technology pragmatists’ what this technology can do for them, why they should care, and helping them use it meaningfully. Potential Broadband Demand is largest market segment in most broadband network footprints based on SNG’s analysis of over 75,000 individual businesses organizations and households are connected, using and benefiting from the internet. This represents significant untapped opportunities for local business growth, workforce readiness, diversified economic sustainability, and community vitality. Broadband Improvement Districts (also known as local improvement districts) are boundaries determined by the local government where the broadband access network is proposed to be built and property owners have the opportunity at the beginning of the process to pay for connecting to the network by attaching the cost over 15-20 years to their property. This is an approach does not require the community to take on debt, nor raise taxes – plus it has shown to reduce subscriber fees by more than 50 percent with higher speeds. See video of this improvement district approach used in Ammon, Idaho. Committed Demand is the level of sign-ups by local property owners to a Broadband Improvement District as part of a digital infrastructure strategy. When committed demand surpasses the threshold for sign-ups (e.g. 60% of property owners), the network can be built and will be sustainable, without requiring the community to take on debt, nor raise taxes.